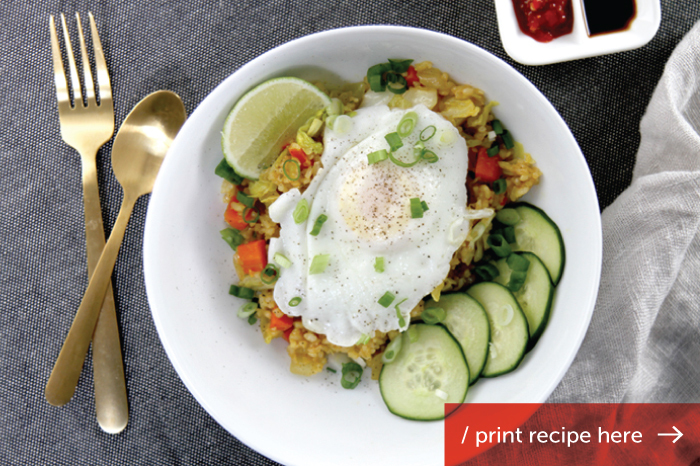 We're often looking for a meal that is fast, flavorful, and easily accomplished -- this Indonesian-Style Fried Rice is frequently the answer. With a little bit of prep work, all of the delicious flavors come together quickly in the wok. 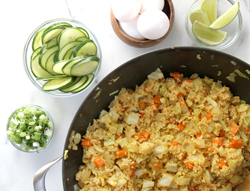 In Indonesia, fried rice is often eaten for breakfast and is made with yesterday’s rice. Choose to add the optional fried egg on top, and we can see enjoying this for brunch, lunch or dinner! 1. Prepare the rice according to the packaged instructions the previous day or at least 2 hours in advance, and let cool. Or, follow our go-to rice recipe: Rinse the rice 3-4 times with water; combine 1-1/2 cups of the rinsed rice with 2-1/4 cup water in a saucepan. For extra flavor, add 1 tablespoon of butter, 1 teaspoon of raw diced onion or shallot, and a pinch of salt. Bring the rice and water to a boil over medium-high heat. Once boiling, turn to low, and cover. Simmer on low for 20 minutes (leave the lid firmly on without peeking!) Keeping the lid on, turn the heat off and let rice sit for 10 minutes. After 10 minutes, uncover and fluff with a fork. 2. 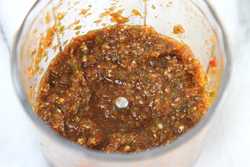 Prepare the sauce paste in a small food processor. Combine the brown sugar, garlic, shallot, Serrano pepper, soy sauce, lime juice, turmeric, coriander, black pepper, nutmeg, salt, and Sambal Oelek, and puree until a paste is created. 3. Prepare all of the vegetables. 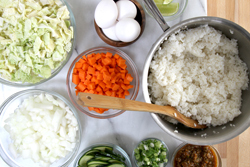 Get everything “mise en place” (translated as “put in place”) before heating the wok. The cooking of this dish happens quickly, so preparation and handiness is key. 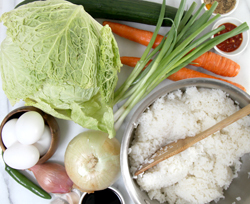 Place all of the ingredients (rice, vegetables, sauce) in small bowls nearby so that they are ready to quickly add to the wok at the right time. 4. Heat the vegetable oil in the wok over high heat until it sizzles when a small drop of water is thrown into the oil. Add the onion and cook until softened. 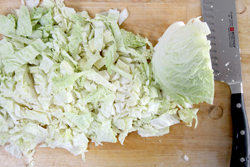 Next toss in the carrots and cabbage, and cook until just barely tender. 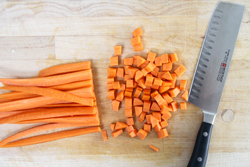 As you cook and add additional components, move the cooked vegetables to the perimeter of the wok adding the next group of raw vegetables to the middle. 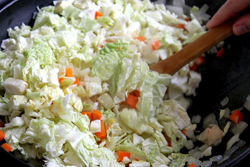 Once all of the vegetables are cooked, add the paste and stir to coat evenly. 5. Add the cooked, cooled rice and stir until everything is mixed together evenly. 6. Fry the eggs (over easy) and immediately lay on top of rice mix. Garnish with the green onion, cucumber, and additional Sambal Oelek (or Sriracha), as desired, and serve.